April 2014 to April 2007: Seven years as Principal Hydrogeologist (Bierman Hydro-Geo-Logic, a Professional Corporation) providing hydrogeologic consulting services to property owners, realtors, investors, architects, vineyards and/or general contractors by managing and obtaining the necessary permits for jobs relating to domestic and commercial groundwater quantity and quality in Monterey County and tri-county area. Specifically, well siting analysis, well design and construction observation, source water assessments, pumping impact assessments, aquifer analysis, groundwater quality analysis, groundwater treatment system design, rain water harvesting design and installation, expert witness research.April 2007 to June, 2003: Provided hydrogeologic consulting services to property owners, realtors, investors, architects, and/or contractors while with Weber, Hayes and Associates. May 2006 to April 2006: Provided environmental consulting services to Swason Ford by managing a large remedial excavation operation within a strict timeline and obtained Hazardous Materials closure from Santa Clara County Fire Department, and regulatory closure from the lead agency, Santa Clara County Department of Environmental Health. January 2004 to April 2007: Provided geologic and hydrogeologic consulting services to Granite Construction and helped in the permitting of their quarry in Gonzalez, California. Subsequent work consisted of providing hydrogeologic consulting services by establishing a long term Monitoring Well Network for determining whether or not quarry operations will have impact to the regional aquifer. January 1996 to April 2007: Provided hydrogeologic consulting services to University of California Santa Cruz (UCSC) by ensuring UCSC remains in compliance with their Long Range Development Plan, which includes water quality sampling, spring flow monitoring and construction site storm water monitoring. January 2003 to April 2003: Provided geologic and hydrogeologic consulting services to a private water company (Rolling Wood Mutual Water Co.) by completing a comprehensive hydrogeologic evaluation. The work consisted of evaluating the regional and local hydrogeologic setting, groundwater resources, water demand, existing source capacity, water balance, and estimates of long term water supply of the aquifer and the location of potential well sites . The work included evaluating regulatory constraints, locating potential well and storage tank sites based on county setback requirements from property lines, septic systems and/or seepage pits, and/or property access and agreements with system patrons. August 2002 to April 2003: Provided environmental and hydrogeologic consulting services to a large construction company by completing a large remedial excavation that consisted of maintaining construction site dewatering by using 14 dewatering wells, half of which were impacted with dissolved petroleum constituents which required extensive monitoring and sampling to ensure dewatering operations were completed according to City and County requirements. Dewatering was required so that excavation operations could remove all contaminated materials below the water table and so that the commercial building slab and basement could be poured. September 2002 to August 2003: Provided hydrogeologic consulting services by preparing well specifications for a water supply well. Tasks involved observing the drilling, geophysical logging and providing final well design, as well as, observing well construction was implemented according to well specifications. January 2002 to August 2002: Provided hydrogeologic consulting services to Hanson Quarry for an amended mining permit. The evaluation address the regional geology, mapping of the watershed, performing technical calculations of storm water runoff volumes based on 25 and 100 year design storms, calculating the quarry’s retention volumes, conducting infiltrometer testing, and evaluating the regional percolation volumes and how it could benefit recharge to regional aquifers and surface waters in the area. 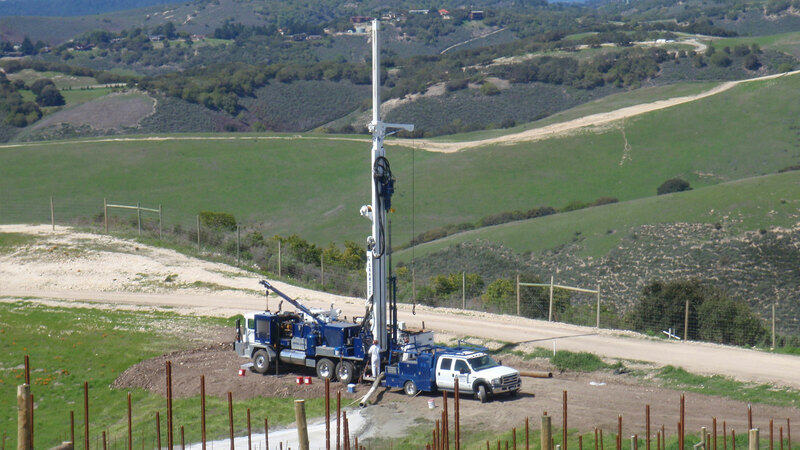 January 2000 to June 2002: Provided hydrogeologic consulting services for a large scale water supply project in Pajaro Valley for Pajaro Valley Water Management Agency. Tasks included the observation of drilling operations, final well design, and observing well construction of several recovery wells surrounding a large recharge basin. Other tasks involved monitoring and assessing the recharge mound around the basin, as well as modeling the effects of recovery well dewatering on the aquifer beneath the basin, and the ability of the recovery wells to reclaim recharged water. August 1999 to January 2001: Provided hydrogeologic consulting services for the University of California Santa Cruz (UCSC) by monitoring 14 springs in a karst aquifer during a dye injector test. Monitoring was completed to determine the connectivity of the karst aquifer, as well as obtain water quality and flow rate measurements of the springs, so that building operations at the University could continue. January 1999 to February 1999: Provided hydrogeologic consulting services for Pajaro Valley Water Management Agency in determining aquifer parameters, water quality and hydraulic connectivity with the Pajaro River for the potential of developing an infiltration gallery beneath the river for capturing river runoff during periods of high flow. January 1996 to March 2000: Provided hydrogeologic consulting services for Bayer Corporation and PTRL-East Inc in completing a pesticide research study. The investigation was completed and regulated by the Federal Insecticide, Fungicide, and Rodenticide Act (FIFRA), and Good Lab Practices (GLP) Standards. The project dealt with determining the pesticide mobility within the unsaturated zone and whether or not the pesticide would migrate to shallow groundwater.